Have you ever wondered how to make your own notepad? The kind where you can tear off one sheet at a time? I’m here to show you that it’s super easy. All you need are a few supplies you probably already have around the house. Read the instructions below and make your own notepad today! You’ll want to cut your scrap paper all to the same size. Cut a thicker piece of paper to use as a backing. I used a piece of leftover watercolor paper. However, you can also use a thin piece of card stock or even a piece cut from a cereal box. Stack your paper and backing, making sure that the top edge is as even and straight as possible. 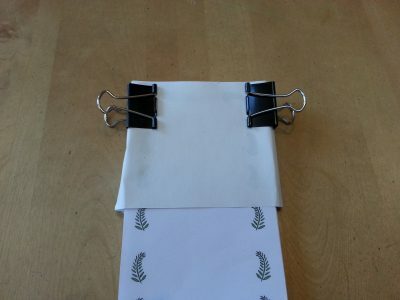 Place one binder clip on each side of your stack of paper, near the top of the pad. Use your paintbrush to paint your padding compound (or rubber cement) along the top edge of your pad. Padding Compound is a flexible glue that can be purchased online. If you use rubber cement, keep in mind that it may dry tacky. If this happens, simply cut a sheet of paper to cover the top edge of your pad. Let the padding compound dry. It should only take about thirty minutes to an hour. One coat should be enough, but you can also do two. If you plan to hang your notepad, attach a magnet to the back with a strong holding glue. Now your notepad is finished. It’s as simple as that! 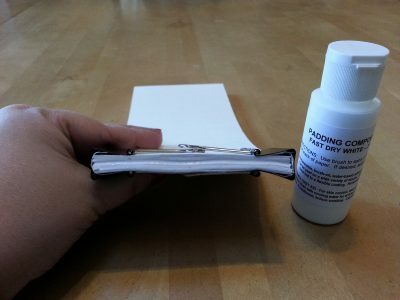 If you are using nice paper or something that you’ve designed and printed, wrap the top of your notepad with a piece of scrap paper before binding and gluing. This will prevent any excess padding compound dripping onto your first sheet. Simply remove the excess scrap paper after the padding compound has dried. Design your own grocery and shopping lists. Use a word processing or design program to design and then print your own lists. You can even hand draw a design and make numerous photocopies. Like the Shopping List above? You can get it for free in my shop. Just click on Floral and Fern Shopping List. Or click on Shopping List to download immediately. 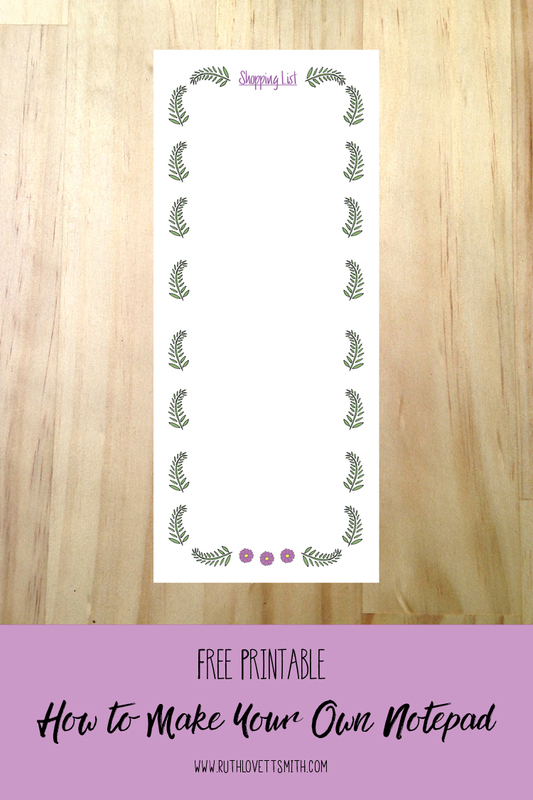 I hope you enjoy this free shopping list! If you do, please share it with your friends by clicking on the share buttons at the top of this post. And don’t forget to CLICK HERE to join my Happy Creating Club. You’ll get my FREE Guide to Happy Creating as well as more free printables.